Don’t shy away from the most tried and true form of direct marketing. Despite a growing number of electronic options, direct mail gets read, generates response, and is as effective as it’s ever been.. At Sendit Media , we provide our clients with over 200 Million up-to-date names and addresses that can be broken down in a number of different ways. All of our lists are NCOA’d and CASS Certified to ensure quality. 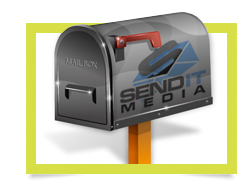 Sendit Media has matching email addresses to almost all of our postal files. Ask us about our Multi-Channel Marketing Approach which can deliver an email and postal piece to the same recipient. Direct Mail marketing allows you to put your offer directly into the hands of qualified leads for the best return. Custom offers and coupons allow you to track the success of your efforts directly and help quantify your ROI Our staff regularly attends direct marketing seminars and follows leading industry news outlets and publications to ensure we can pass that information on to our clients to make the most of their direct mailing campaigns.